THE MAGIC OF TONE and the Art of Music, by Dane Rudhyar. This long-awaited title, out-of-print since 1987, The Magic of Tone is now available free online at the Rudhyar Archival Project. Serious interest in Rudhyar's pioneering work as a composer is growing rapidly. The Magic of Tone comprises Rudhyar's last word (written in 1982, three years before his passing) on Sound, Tone, Music and the Rhythm of Civilization and Culture. • Rudhyar's Integration of Experience and Concepts - Music, from Leyla Raël's The Essential Rudhyar. • Dane Rudhyar's Vision of American Dissonance, by Carol Oja. American Music, Summer 1999. When Does Sound Become Music? by Dane Rudhyar. In his last article on music, Rudhyar addresses the question: When Does Sound Become Music? In doing so, Rudhyar recalls the words of his old friend Edgard Varèse - "Music must Sound!" Here Rudhyar makes one of his rare references to Rock music, and traces the birth of "Space" music as reaction to Rock. Together, Rock and Space music are seen as two aspects of the soul of a generation. From 1984. Read it now . . . The Transforming Power of Tone and the Meaning of Dissonance by Dane Rudhyar. On the evening of 5 March 1972, KPFA-FM sponsored a performance of Rudhyar's music at Live Oak Park Theatre in Berkeley, California. 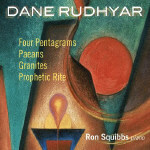 Pianist Michael Sellers performed three compositions by Rudhyar: Granites (1929); Pentagrams Book III "The Release" (1924-25); and Syntony (completed and revised 1968). During the intermission, Rudhyar spoke on The Power of Tone and the Meaning of Dissonance. Read it now . . . Early Musical Writings - Seminal Writings on the New Music of the XXth Century by D. Rudhyar. The Rudhyar Archival Project is pleased to announce Rudhyar's musical writings from the 1920s will be added to the online Archive during September 2004. These provocative, seminal writings include The Relativity of Our Musical Conceptions, Dissonant Harmony, and 'Going Back' in Music - To Where?, as well as articles on the music of Varèse, Ruggles, Scriabin and others. A CD-ROM compilation featuring the articles - along with The Magic of Tone and The Rebirth of Hindu Music - in printable Adobe PDF format will be issued later this year.